If you like winter and snow then your probably like winter sports and in that case you need this t-shirt as it shows all the ski gear you need. 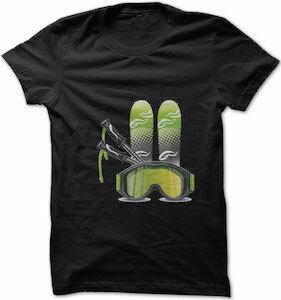 The t-shirt just simply shows skies, poles, and ski goggles and they all have a green hue over them. You can get this ski t-shirt in styles for men and women and it is available in sizes Small – 4XL and comes in many fun colors. So get ready for the powder so put the t-shirt on and get your gear ready for the season of snow and fun.